It's been almost a month since the last fashion photo spotlight. So today I'm bringing you Pablo Baudet. He has some impressive works, which come not only in a large number but also with great expressivity attached. Take the first photo. It's my favourite of the bunch. 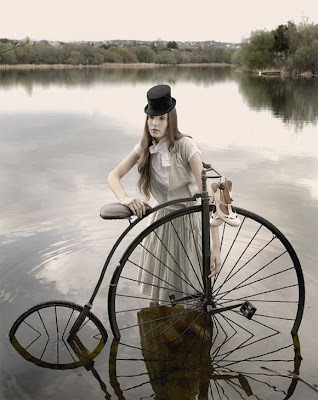 If you break things down, the girl is wearing a top hat, holding a pair of shoes and a bicycle in a lake. It sounds hilarious if you read my above sentence, but looking at the shot, you can just stare in awe. Well, at me, at least. And I'm sure you too would like to have such a great vintage look on your worst day! Haha. No, really, it's awesome. I appreciate photographers like Baudet who can creat such small, well planed scenaries. The same goes with the other photos. If we stop to think about the natural environment around, it may come odd to bring in the same context objects generally suited for interior decorations. Read: wallpaper, framed photos, a white bird cage or pieces of furniture. None of them is meant to be a central piece more than the others. When it comes to clothes, they come in pastel shades and most certainly in natural materials like cotton. Delicate and blending in perfectly with the surroundings. I'm a fan of that pair of trousers as well of the lace hair accessory. These are gorgeous! And now I want a bicycle like that. Merci mult pt commentul de pe blogul meu :) I'd love to do a link exchange!